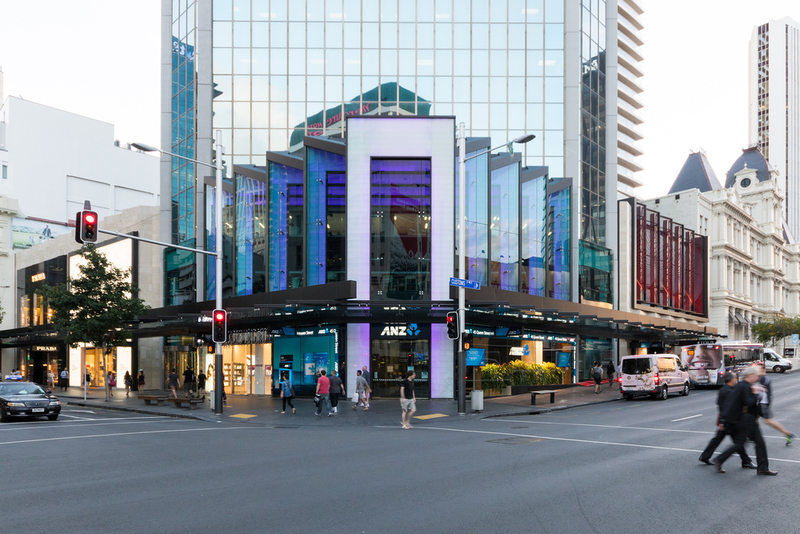 The redevelopment of the 45 Queen Street tower in downtown Auckland transformed a tired and inefficient building into a world-class, future-proofed asset, attractive to high quality retail and commercial office tenants alike. 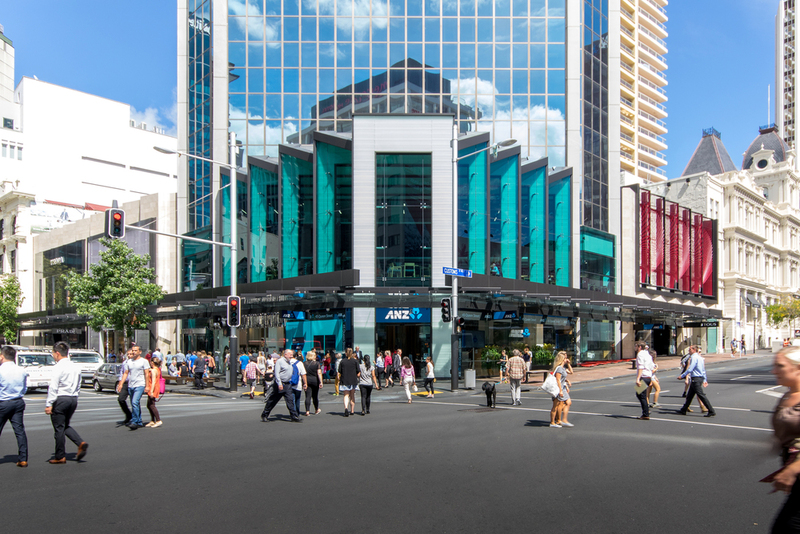 Sitting in pride of place on one of the busiest intersections in central Auckland, 45 Queen Street forms part of the gateway to the CBD and is passed by thousands of commuters and visitors to the city every day. The original building had become dated and inefficient and asset owner, AMP Capital, saw an opportunity to reconfigure it to attract high quality tenants and increase long-term occupancy. Making best use of the constrained site was a key driver within this project. To maximise the high value space on the ground floor, the existing lobby was relocated to level one and entry to the 17-level office tower was repositioned. A new level one atrium was designed to span two storeys and incorporate a high spec café, with spectacular views to the nearby harbour. The building’s ground floor was rebuilt as quality retail space, with ANZ choosing the prominent corner site for its flagship branch. On either side of the bank, the remaining retail space was designed to accommodate luxury retail tenants, including Prada, Christian Dior and Swarovski. In keeping with the brief, these retail spaces were designed to be easily reconfigurable. The tower’s prominent CBD location and proximity to iconic, historic buildings meant rigorous urban design planning was critical. The project team worked closely with Council planners and urban design representatives to create a design that would make a positive impact on the street corner, provide a visual lift to the street canopy and integrate well with neighbouring historic sites, such as the Dilworth building. This pre-lodgement effort meant Resource Consent was issued well within the typical 20 working day period – an impressive feat for such a significant project. 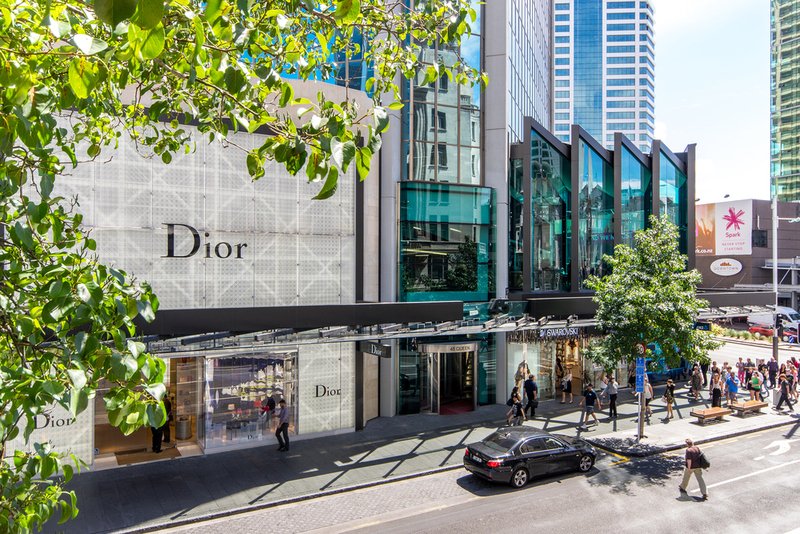 It also meant that the upgraded building acted as a fresh catalyst in the ongoing transformation of lower Queen Street into a world-class, luxury retail precinct. With a long-term vision for the asset, creating a quality space with a long life-cycle and low maintenance requirements was critical to the client. Each material specified was assessed, based on its technical performance, whole-of-life cost, aesthetic quality and fit with the overall design concept. As the site of the building was once Auckland’s original shoreline, the podium design drew on the area’s earlier natural features for inspiration. A faceted limestone façade referenced the sandstone cliffs that once stood on the spot, and the wave pattern and geometry of the atrium and canopy were designed to reflect waves washing onto the shore. The use of blue-green tinted glass provided a further connection to the water, while dark bronze trim and flashings complemented the trim colours on the neighbouring historic buildings. The extensive use of glazing on the two-storey high atrium created potential solar heat gain and glare issues. To counter this, the architectural team worked closely with façade and thermal engineers, as well as the glass supplier, to design a highly-engineered glazed structure that would ensure a comfortable environment and minimise ongoing mechanical ventilation energy requirements. As the original podium is seismically separated from the tower structure, the architectural team consulted with structural engineers to incorporate an innovative seismic separation system that not only meets the new seismic codes but also complements the luxury retail facades.